If you feel as if you’re being crushed by your debt we can empathize. According to an article published on TheAtlantic.com, student loans give young adults so much stress. A lot of people are suffering from this financial situation. There were times in our history when we had so much debt we couldn’t afford to give each other Christmas presents. The good news is that you can get out of debt but it won’t happen overnight. It’s usually a slow process that can take two or even more years. Of course, you can do it sooner but this will depend on how committed you are to follow through. And, of course, how much you can afford to pay towards getting out of debt will have an impact, too. But if you follow the steps in this article you will become debt free. Spend some time reflecting on how you got into so much debt. If you’re sincerely committed to getting out of debt you need to first understand what you did and then change the habits or circumstances that led to your problems. For example, some people ended up in serious debt because they overindulged and over borrowed. Of course, you may not have done this. The reason you have so much debt may be due to something over which you had no control. The reason might be that you had a serious illness, which resulted in a lot of medical debts or because you had a divorce. 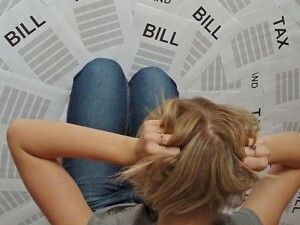 According to an article published on HuffingtonPost.com revealed that 62% of bankruptcies in the country. The important thing is to recognize what you did to get into so much debt so that you can take the steps necessary to not do it again. Once you have determined how you got into so much debt you need to change the habits that got you there. This probably means you will need to stop spending too much money. Create a budget and start building an emergency fund. You will need to track all of your spending for at least 30 days and then divide it into categories and total up each of your categories. You will then know exactly where your money has been going. Now that you know this it’s time to make changes. If you find you’re spending too much money in one category look for ways to cut back on that expense. For example, suppose you find more than 25% of your income is going towards food. You should then figure out how much you could reduce your food cost. 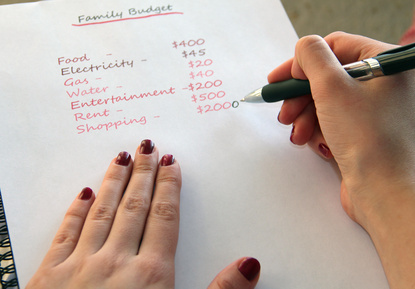 You might use the 50/30/20 rule of budgeting to help keep your spending in check. If you’re typical you’ve become oblivious to how much you actually owe because the idea of figuring it out is just too painful. However, now’s the time to face reality. Make a list of all your debts including the amount you owe on each, its interest rate and its minimum payment. You will need to use recent billing statements, bank statements or canceled checks and your credit report to make sure you have a complete list of your debts. Are you making just the minimum monthly payments on your debts every month? If so, it could literally take you decades to get out of debt. You will pay it off much faster if you pay more than the minimum amount on at least one of your accounts every month. You could get extra money to pay off your debts by getting a second or part-time job, by selling stuff in yard sales or on eBay or if you’re fairly crafty you could sell items on Etsy. There are literally dozens of ways to earn extra money and, of course, the more you earn the faster you will be out of debt. You don’t have to make a debt payoff plan that’s terribly complex. All you really need to do is prioritize your debts either by their interest rates or their balances or some other criteria that you choose. Next, calculate how much you’re going to pay every month. What’s generally best is to make a lump-sum payment on one of your debts while paying the minimum amounts on all your other accounts. When you get that first debt paid off then re-direct your lump sum payment to the next debt on your list. You could use a debt repayment calculator to see how your plan will play out. Some of these calculators allow you to enter a specific monthly payment or a deadline for becoming debt-free to help you customize your repayment plan. Now that you have a plan and an amount that you will pay monthly the next step is pretty simple. Just send your payments every month without fail. This is the part of your plan that will take the longest. It could be several years depending on the size of your debt and the payments you make. For example, if you owed a total of $25,000 in credit card debt at 15% and made a payment of $500 a month, you would not be debt-free until July 2021 and would pay $14,478 in interest. However, if you earn extra income and up that payment to $750 a month, you would be debt free in August 2018 and would pay just $7543 in interest. You could also accelerate your debt repayment by using tax refunds and any monetary gifts you receive to pay off your debt. The final step is to bounce back from your debt problem. You may find it’s not smooth sailing. In fact, you might find your path to debt relief is full of potholes and speed bumps. As an example of this, you might run into a financial emergency that would require you to cut back on those increased payments for a few months. But as quarterback Aaron Rodgers once said R-E-L-A-X. It’s really okay. Just get back to making those increased payments as quickly as you can. It’s natural to get discouraged when it comes to paying off debts its just, well, not much fun and can take a long, long time. If you find yourself getting discouraged try to focus on the end result – the month you will be totally out of debt – and visualize how good that will feel.